Desire is responsible for making a man a sinner. When it sees and object of the sense, desire seeks it. For the sake of getting what he wants man begins to strive for it. The objects of the senses appear so agreeable that man tries his best to get them. Attachment follows in the wake of desire. Immediately follow aversion, greed and error of judgment. The mind becomes confused, clouded, and man does not any more follow the path of virtue. He now becomes a hypocrite by assuming to have a virtue he does not possess. He uses this hypocrisy to attain social status and wealth. Thus he embarks on the downward path to sin. A man who is righteous seeks the good of others and so he wins good for himself. He is wise and knows how to avoid the pitfalls created by the senses. He is wise to understand the real nature of sorrow and happiness. Such a man attains the mastery over the senses and it is called virtue. Knowledge helps him to be free of desire. Such a man will strive more and will not rest until he has mastered the art of renunciation. There is no doubt that all teeths are capable of purifying man. But the best of all Tirthas which is capable of purifying man is – Truth. On should bathe in the Tirtha called the mind which cannot be fathomed, which has no stain and which is pure. This tirtha has Truth for its waters and the lake of the mind made up of understanding. Once a man bathes in this Manasarovar, he becomes heir to sincerity, greatness, truthfulness, compassion, self-restraint and tranquility. 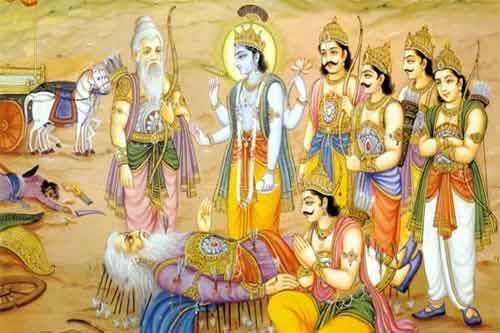 Only Dharma, righteousness, follows the human body that has been abandoned by all (while living or after death). That is the only friend of man and that is the one thing that should be sought by man. Earthly bondages are so easily formed. It is easy for anyone to nurture the plant of attachment which is but another name for death. Dharma, Artha and Kama exist together, side by side, when a man amasses wealth always take care to walk in the path of Dharma. Wealth has its root in virtue, and pleasure is said to be the fruit of wealth. All of these again, are firmly planted in Will. Objects exist in this world for the gratification of the senses, and Will is concerned with these objects. The sum total of the three depends on these. Dharma, Artha and Kama have one quality in common: passion. The pursuit of these three for the sake of themselves, with a desire to enjoy their fruits, makes the rewards remote. However, if the pursuit is spurred by a desire for knowledge, the knowledge of self, when they become the means for an end which is noble, the realization of self, then the reward is immense. Dharma is to be acquired for the purification of the soul. Wealth or Artha may be acquired so that it may be spent without any desire for the fruits. Pleasure should be pursued just for supporting the body and not for gratifying it. Dharma, Artha and Kama are not ends in themselves, but are just means to an end, and that end is Moksha. These three should be abandoned when one has freed oneself by ascetic penance.